Inner size 1st shelf : 23″ x 7″ (LxB); 2nd shelf : 21″ x 5″ (LxB); 3rd shelf : 19″ x 10″ (LxB). 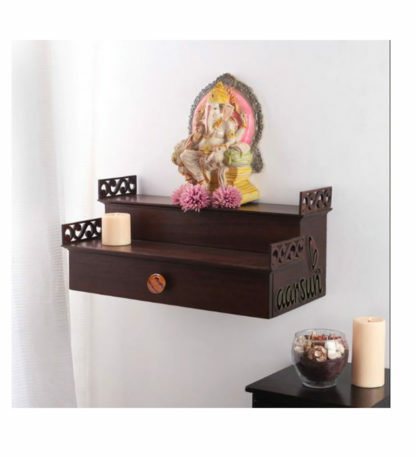 Aarsun handmade Wooden shelf / Wooden Wall Bracket in fine carving and good finishing. The unit is made up of fine quality engineered wood and you can easily place it anywhere in your wall. Wooden Wall Bracket is a support, as of metal or wood, projecting from a wall or the like to hold or bear the weight of a shelf, part of a cornice, etc. You can easily place any thing over there like your idols or any other decorative piece over there. The unit is best suitable for your home and office. you can also use it as a gift item for your near ones. Please note that the screws are not a part of the deal and needs to be purchased locally. The surface of MDF is very smooth, and you don’t have to worry about knots on the surface. Also because of its smoothness, MDF is a great substrate for veneer.